We are a leading Exporter of rod mills, froth floatation apparatus, ball mill, cone classifier, cyclone separator and fluid mixing apparatus from Ambala, India. Rod mills are horizontal rotating cylindrical steel chamber of half filled with steel rods of length slightly less than the length of chamber. The rods are of different diameter. The size reduction is accomplished by the impact of rods as they fall back after being lifted by the rotating chamber. Road mill is fitted on a sturdy ms frame. Charging of rods and material is done by the means of opening provided in the chamber. The chamber is turning about the horizontal axis through a reduction gearbox drive through a 1/2 hp motor. The stepped pulley arrangement is done for moving the rod mill at three different speeds. A revolution counter is provided to find out the number of turns. Special arrangement is done to free the rod mill from reduction gearbox for charging and discharging the material. To study effect of rpm on the power consumption of a rod mill. 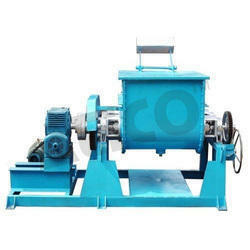 To determine the efficiency of a rod mill for grinding a material of known wi. Electric supply : single phase, 220 v ac, 1 kw. Dia 275mm, length 350mm. Thickness 5 mm. Discharge chute : suitable size. Revolution counter : mechanical type. Product receiver : material stainless steel of suitable size. Energy measurement : electronic energy meter. Mcb : for overload protection. The set-up is fitted with required guards. Mixed liberated particles can be separated from each other by floatation if there is sufficient difference in their wet ability. The floatation process operates by preparing a water suspension of a mixture of relatively finely sized solids. This is usually done in an agitated chamber open at the top. Fine bubbles of air are then dispersed through the agitated suspension to form a froth that rises to the top of the chamber. Particles that are radically wetted by water (hydrophilic) tend to remain in the water suspension. Those particles that are not easily wetted (hydrophobic) tend to be collected at the air bubble-water interface and rise to the surface attached to air bubbles. Thus differences in the surface chemical properties of the solids are the basis for separation. The set up consists of a agitated chamber open at the top. In the chamber, an impeller coupled to a shaft is fixed in a stationary diffuser. Low-pressure air is allowed to enter in the stationary diffuser through the air passage provided with the agitator. The collector coated mineral particles adhere to the rising bubbles and are carried to the top of the cell to be removed in the froth product. To study the performance of Froth Flotation Cell. 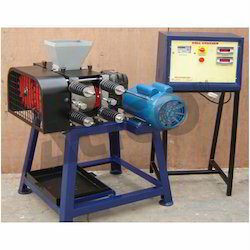 To find % recovery of mineral in froth from a standard mixture. Material for Feed, Frothing agents and collectors. Compressed Air Supply 1 CMH at 2kg/cm2. Electric Supply: Single phase, 220 V AC, 0.5 kW. Floor Area 1.5 m x 1 m.
Flotation Chamber: Material Stainless Steel, Compatible capacity. Agitator : Stainless Steel Impeller with Stainless Steel shaft coupled to FHP motor. Diffuser: Material Stainless Steel holding the impeller. 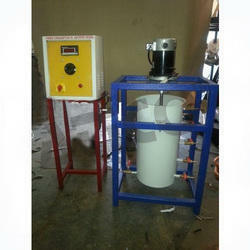 Froth Collecting Tank: Material Stainless Steel, Capacity 20 Ltrs. Control panel Comprises of:Standard make On/Off switch, Mains Indicator etc. A good quality painted rigid MS Structure is provided to support all the parts. 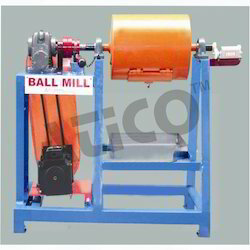 Ball Mills are horizontal rotating cylindrical steel chamber of half filled with steel balls. The size reduction is accomplished by the impact of balls as they fall back after being lifted by the baffles fitted in the rotating chamber.Ball Mill is fitted on a sturdy MS frame. Charging of balls and material is done by the means of opening provided in the chamber. The chamber is turning about the horizontal axis through a reduction gearbox drive through a ½ HP variable speed motor. Drive is provided to vary the RPM. A RPM indicator with proximity switch is provided in the set-up. A revolution counter is provided to find out the number of turns. Special arrangement is done to free the Ball Mill from reduction gearbox for charging and discharging the material. Ball mill : material ms dia 275mm, length 350mm. Thickness 5 mm. Rpm measurement : digital rpm indicator, non contact type with proximity sensor. Cone types classifiers are one of the oldest types. The conical vessel has angle of 60o. The feed is fed from the top. Water is passed at a controlled velocity. The coarse solids travel down the sides and can be removed from the bottom. Fine particles are separated by over flow. Bottom product tank is provided with the setup. To determine the separation efficiency of given classifier. To determine the effect of velocity on separation efficiency. Classifier: material stainless steel cone type having angle of 600. Water feed tank: material stainless steel, capacity 60 ltrs. 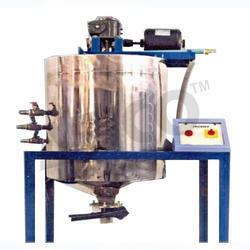 Bottom product tank: material stainless steel, capacity 10 ltrs (approx.). Fine particle collector: nylon cloth. To study the performance of a given cyclone. To study the effect of inlet gas velocity on overall efficiency. Floor area 2 m x 1 m.
Air flow measurement: flow meter with manometer. Solids collector: transparent PVC container fixed with cyclone. Fine dust collector: bag of nylon cloth fixed on exit of air. For a processing vessel to be effective the volume of fluid circulated by the impellers must be sufficient to sweep out the entire vessel in a reasonable time. The velocity of the stream leaving the impeller must be sufficient to carry the current to the remotest parts of the tank. Liquids are most often mixed in some kind of tanks or vessels, usually cylindrical in form and with a vertical axis. Tank bottom is rounded to eliminate regions into which the fluid currents would not penetrate. In the present set-up mixing is done with the help of stirrer. The stirrer is complete with ss impeller with ss shaft coupled to fhp dc motor. The speed of agitator can be varied with the help of thyristor controlled dc drive and power consumption is measured by digital voltmeter & digital ammeter. Four replaceable baffles are provided to prevent swirling. One 4-bladded propeller and one 6-bladded turbine are provided which are interchangeable. Drain valve is also provided at the bottom. Effectiveness of power consumption in fluid mixing can be performed with and without baffles hence increasing the range of experimentation. The whole set-up is mounted on a rigid ms frame structure. To plot power number vs reynolds number for the given set of impeller with baffled/ unbaffled mixing. To study the mixing characteristics of give solid/liquid mixture. Tank : material stainless steel. Variable speed motor and drive. Baffles : material stainless steel, 4 nos. 2” width. (detachable). Sampling point : 4 nos. At random locations. Materials, that have different magnetic at tractability, may be separated by passing them through a magnetic field. Most often, magnetic separation techniques are used to remove iron, steel or magnetic iron oxide from materials low in magnetic at tractability. These devices operate in either a continuous or a cyclic manner. Continuous devices usually have a belt which moves over the lifting magnetic poles to carry the magnetize partials into a region of low or zero magnetic field, where they are released. The present set-up is of in-line lifting magnet type. The set-up consists of two belts moving separately in opposite direction at slow speed. Feed through a vibrating hopper is conveyed over first belt and allowed to pass near the second belt, which is under magnetic field. The magnetic field is generated by permanent magnet kept in a box. Magnetically inert material drops off the belt in a normal manner. Magnetic material is held on the belt, however, and finally drops off the belt as it leaves the magnetic field. Both the belts are fitted on the pullies and derived by an electric motor coupled with a reduction gearbox. To study the principles and operation of a magnetic separator. To determine the efficiency of magnetic separator. Drive: fhp motor with reduction gear box. Magnets: permanent magnets kept in a stainless steel chamber. Collecting bin : 2 nos. One each for magnetic and non-magnetic material. The set-up is fitted with required guards and product collection tray. A jig is a mechanical device used for separating materials of different specific gravity by the pulsation of a stream of liquid flowing through a bed of material. 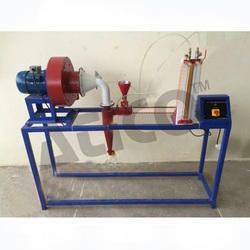 The setup consists of plunger operated by crank mechanism connected to motor coupled with reduction gear box. Sump tank with pump is provided for water circulation. To calculate percentage recovery of small particle. Electric supply: single phase, 220 v ac, 50hz, 5–15 amp combined socket with earth connections. Mineral jig tank: material stainless steel. Sump tank: material stainless steel, compatible capacity. Product tank: material stainless steel, capacity 10 litres (approx. ), 02nos. Control panel comprises of: standard make on/off switch, mains indicator etc. The lab setup is used to crush different sample and material. Two heavy smooth faced chilled metal rolls turning on parallel horizontal axes are the working elements of the roll crusher. A hopper is provided at the top for feeding the material. Particles of feed caught between the rolls are broken in compression and drop out below. The rolls turn towards each other at the same speed. They have relatively narrow faces and are larger in diameter so that they can nip moderately large lumps. Loading bolts are provided for safety. The maximum size of the product is approximately equal to gap between the rolls & it can be adjusted by loading bolts. 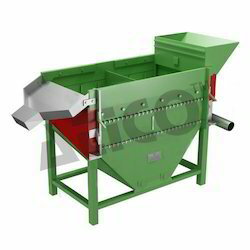 To determine the efficiency of the crusher for crushing a material of known working index. Electric supply : single phase, 220 v ac, 2 kw. Energy measurement: electronic energy meter. 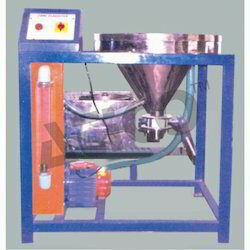 The rotap sieve shaker reproduces the circular and tapping motion given to test sieves in hand sieving. The uniform, mechanical action ensures accurate and dependable test. Using the regular height 20-cm diameter sieves, one sample can be tested on a series of six sieves of different openings, all with one operation of machine. 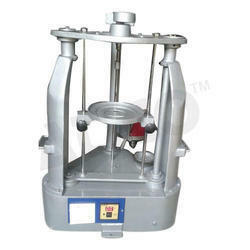 The Rotap Sieve Shaker is simple and durably constructed and is run by a FHP motor. The running parts operate in oil. The machine is easily installed. No special foundation is required. 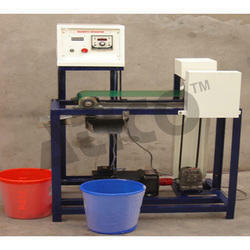 Test Sieves are supplied at extra cost. A time switch from 0 to 60 minutes is provided. The universal mixing and kneading machine consists of two counter-rotating blades in a rectangular trough curved at bottom to form two longitudinal half cylinders and a saddle section. The blades are driven by gearing at either or both ends. The mixing action is a combination of bulk movement, smearing, stretching, folding, dividing and recombining as the material is pulled and squeezed against blades, saddle and sidewalls. The blades are pitched to achieve end-to-end circulation. Rotation is usually such that material is drawn down over the saddle. The blades are tangential and run at different speeds, with the advantages of faster mixing from constant change of relative position. The blade design most widely used is the sigma blade. The sigma blade mixer is capable of starting and operating with either liquids or solids or a combination of both. The sigma blade has good mixing action, readily discharges materials that do not stick to the blades, and is relatively easy to clean when sticky material are being processed. The drive is given through an electric motor coupled to a reduction gearbox. The whole assembly is fitted on rigid ms structure. 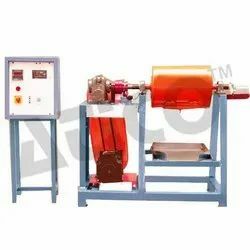 The tilting mechanism is provided for discharge of product. Electric supply: single phase, 220 v ac, 50 hz, 5-15 amp combined socket with earth connection. Earth voltage should be less than 5 volts. Floor area: 1 m x 1 m.
Sigma blades: material stainless steel, 2 nos. Moving in opposite direction. Drive: 1 hp motor coupled to reduction gear box. Tilting arrangement: using worm & gear provided so as to tilt the container from (0-110 Degree) even in running condition. 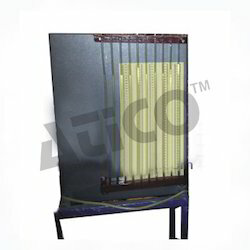 Control panel comprises of : standard make on off switch, mains indicator etc. An english instruction manual consisting of experimental procedures, block diagram etc. Will be provided along with the apparatus. The whole set-up is well designed and arranged on a rigid structure painted with industrial pu paint. Industrial sedimentation operations may be carried out batch wise and continuously in equipment called thickener. The equipment is a cylindrical tank with openings for a slurry feed and product draw off. The tank is filled with dilute slurry and slurry is permitted to settle. Continuous thickeners are large diameter, shallow depth tanks with slowly revolving rakes for removing the sludge. The slurry is fed at the center of the tank. Around the top edge of the tank is a clear liquid overflow. The rake serves to scrap the sludge towards the center of the bottom for discharge. The motion of the rake also stirs only the sludge layer. This gentle stirring aids in water removal from the sludge. The set-up consists of several basic components: a tank to contain the slurry, feed piping and a feed well to allow the feed stream to enter the tank, a rotating rack mechanism to assist in moving the concentrated solids to the withdrawal points, an underflow solids-withdrawal system and an overflow launder. 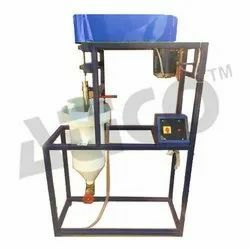 A feed tank, feed pump, and feed tank agitator is provided. A bin for collecting concentrated material is also provided. To study the working of continuous type thickener. Electric supply: single phase, 220 v ac, 1.5 kw. Floor area 1 m x 1 m.
Thickener: material stainless steel dia 400 mm, height 150 mm. Thickener agitator : ss impeller with ss shaft coupled to fhp motor with reduction gearbox. Slurry tank: material stainless steel, capacity 100 ltrs. Slurry feed pump: gear pump with fhp motor. Piping system : gi and pvc. Vibrating screens are those, which rapidly vibrated with small amplitude, are less likely to blind than gyrating screens. The vibrations may be generated mechanically or electrically. Mechanical vibrations are usually transmitted from high-speed eccentrics to the casing of the unit and from there to inclined screens. The setup consists of three different screen with 380mm width and 600mm length fitted on a rigid m.S. Frame, feed hopper, eccentric etc. Three screens of different sizes are fitted one above the other. The drives are given from an electric motor. Demonstration of vibrating screen. To find out the screening efficiency. Vibrating screen (3 nos. ): width 380mm, length 600mm. Feed hopper: compatible capacity with arrangement to control feed. Collecting bins: 4 nos. Of suitable capacity. Looking for Mechanical Operational Lab ?